1. Gather your apples. Pick about 5-6 for this project and check them for worm holes, rot or small stains. Only pick the prettiest ones. You can peel the apples or leave the skin on. If you have kids and want to make them eat it, kids usually prefer peeled apple rings. Then, with a corer, remove the seeds, leaves and stems until they look like the apples in the picture. 3. Cut the apples into 2-3 mm wide rings, but throw away the top and bottom ring as they easily mould and are basically only skin anyway. 4. 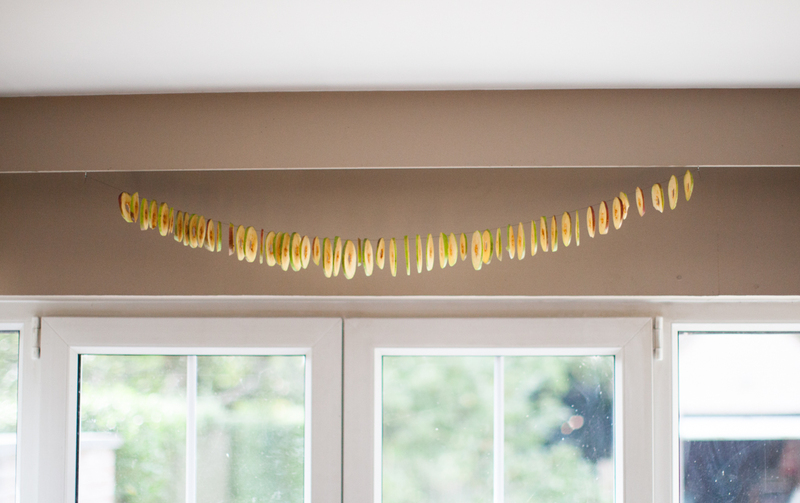 Grab a 1metre long thread (strong enough to hold 6 apples!) and a needle. 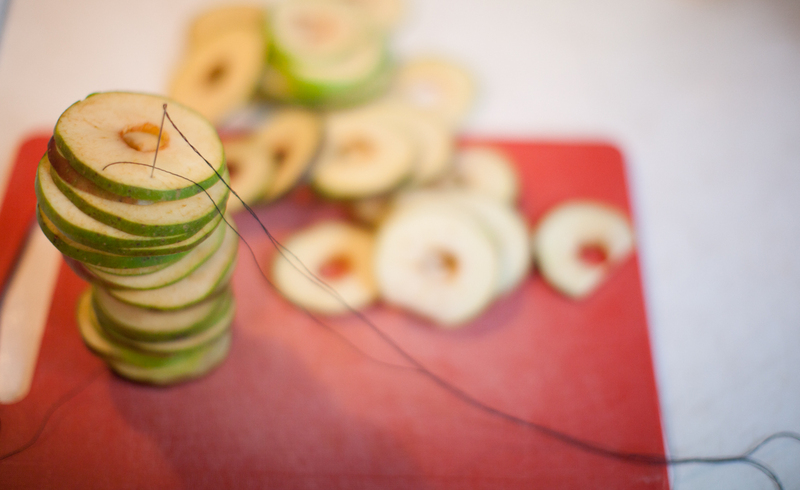 Pierce a few apples at a time and pull the thread through. I made a knot around apple number one to make sure they stayed on the thread and saved about 30 cm on the same side to be able to hang it. 4. Between two securely attached nails, hang up the garland. 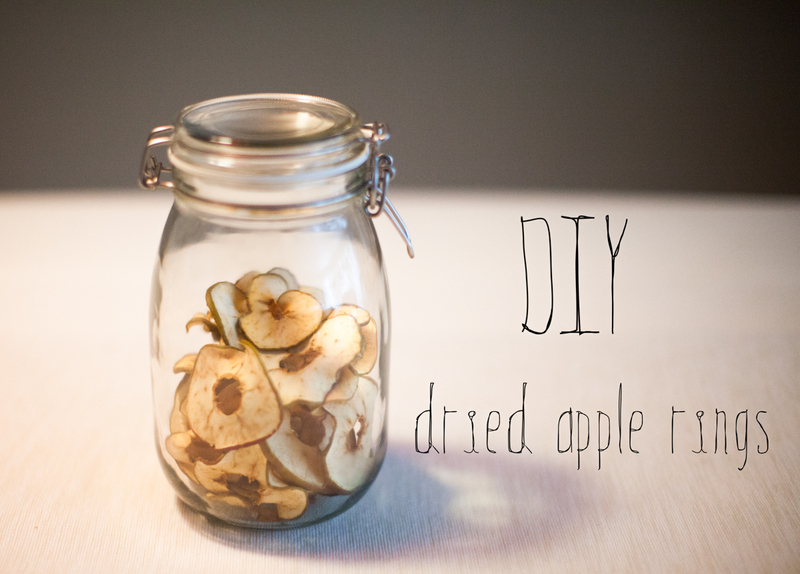 Spread out the apples evenly on the thread and give the apples a week or two before eating or storing them. For storage information, see below. Good luck! Storage advice: Dried products must be protected from moisture, light, dust and excessive heat and the best storage place is a dark and dry place with a temperature of 10-20 degrees Celsius. Packaging materials are brown paper bags, plastic bags, cloth bags of dark and dense fabric, glass jars and wooden boxes. It’s good to write down the content and packaging date on all the packages, it’s so easy to forget 😉 Vegetables, berries, fruit and mushrooms can be packed tightly, but herbs are packed loosely. Brown glass jars can be store in the kitchen shelves, but transparent glass jars must be kept in a dark place, a cupboard for example. 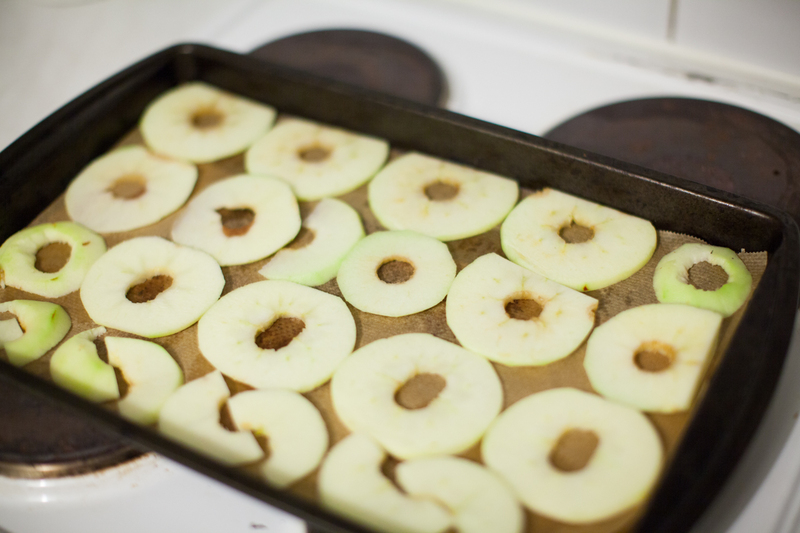 Alternative drying method for a quick snack: Spread out the apple rings on an oven plate and dry them overnight on the lowest heat, at 50-100° C.
In the top ten of the favourite posts, thankyou! Lovely blog, it loads really quick and looks very awesome.